Will Brodie (MID, $466K) certainly demanded a call up after 38 touches and 132 fantasy points. It could be tough to find room after a great win but regardless is in contention. Tom Nicholls (RUC, $242K) was very good with 33 hit outs and 112 points. I find it hard to see him come in to help out Witts, but if he does, will be a decent bench option to consider. Ben King (FWD, $264K) has 7 touches and 31 points. He will probably need a few more weeks in the NEAFL before and AFL call up. James Rose (FWD, $223K) was outstanding with 4 goals, 39 touches and 135 DT points. He could be one in contention to come in for McVeigh but plays a bit more of a wing role. Ryan Clarke (DEF, $467K) would be my pick to come in for McVeigh after 27 touches and 6 tackles for 93 points. A pretty like-for-like swap with McVeigh and makes sense to come in. Darcy Cameron (RUC, $170K) was back in the NEAFL with 17 touches for 92 points. Hard to see him getting a game with Naismith fit again. (or close to it). Colin O’Rioirdan (DEF, $366K) was prolific with 26 touches, 7 marks and 88 fantasy points. He would get a game in a lot of sides but is unlucky not to be playing for Sydney. Aiden Bonar (MID/FWD, $351K) had 30 touches, including 21 kicks. He kicked a goal as well and managed 112 points. Dawson Simpson (RUC, $535K) was very good with 47 hitouts and 103 points. I doubt he will get a game with Mumford back in. Jackson Hately (MID, $244K) racked up with 27 touches and 6 tackles for 100 points. I feel like he could sneak into the 22 soon if he has another couple of good games in the NEAFL. Nick Shipley (MID, $170K) kicked a goal and had 27 touches for 98 points. We all know what happened last time he got an AFL game, so I reckon he’s a fair way off. Tom Cutler (MID, $614K) was very good with 4 goals, 22 touches and 112 points. I find it hard to see him get a game after the Lions are currently 3-0, although Zac Bailey is out for a month after hurting his hamstring. Allen Christensen (FWD, $530K) is a more like for like replacement for Bailey and after his 34 touches, 1 goal and 110 points, is a likely option to come back in. I certainly wouldn’t touch him in classic though. Corey Lyons (MID, $170K) has always racked up int eh NEAFL but struggles to get a game. He had 18 touches, 2 goals, 9 tackles and 104 points on the weekend. Archie Smith (RUC, $217K) was decent with 15 touches, 28 hitouts and 69 DT points. Cedric Cox (DEF,$289K) was outstanding and showcased his pace with 3 goals and 92 fantasy points. He’s also one who could come in for Bailey but I think Christensen is just leading that race. Roark Smith (DEF, $290K) was very good in the first VFL game of the year, booting 4 goals from 21 touches, and amassing with 115 fantasy points. Johanissen is set to return so I find it hard to see him getting a game. Will Hayes (MID, $170K) was very solid with 24 touches, 1 goal and 6 marks for 97 points. If he does get a game, he is a mature aged recruit and a very decent scorer, so he should be a popular downgrade option. Bailey Williams (DEF, $560K) was quite good after being ‘rested’ against the Hawks. He had 19 touches, 7 marks and a goal for 74 points, and could come in for someone like Lewis Young or Ed Richards. Ed Phillips (MID, $481K) I feel is really unlucky to be playing 2’s as he has a lot of potential, but racked up 17 touches and a goal for 85 DT points. Billy Longer (RUC, $484K) made his VFL return and managed 47 hitouts for 81 points. Rowan Marshal has been playing ruck in his absence which has seen scores of 103 and 122. I personally think Longer may have to play VFL a couple more weeks, as the Saints won the hitouts against Fremantle and Marshall has been very effective. Nick Hind (MID, $170K) was popular during the pre-season but only managed 66 points featuring 18 touches and a goal. Brandon White (DEF, $336K) was very imrepssive but int much of a fantasy scorer. Just 55 points from his with 14 touches, but is a chance to come in this week. Jack Steven is also set to return who was rested over the weekend. Ryan Abbott (RUC, $531K) was solid with 2 goals, 18 hitouts and 7 marks for 95 fantasy points. He could come in for Raugolea if he doesn’t lift his game, who’s been underperforming lately. Zach Guthrie (DEF, $303K) was one of the better players with 16 touches and 72 points, but with Henry, Bews and Touhy all in line to return from injury in the following weeks, he’ll struggle to play. Always a chance though. Darcy Fort (RUC, $170K) kicked 0.3 and won only 2 hitouts playing mainly as a FWD, for 58 points. He isn’t appearing to replicate his junior numbers inhale JLT or VFL thus far. Quinton Narkle (FWD, $320K) wasn’t at his best but had 16 touches and 4 tackles for 56 points. If Tim Kelly onset get up (although he should), Narkle could come into consideration. There’s a bit happening at the Tigers this week. Caddy and Grimes return but Short, Dusty and Cotchin go out. Houli is a chance to come in. Shai Bolton (FWD, $223K) did his chances no harm after having 21 touches and 95 points on the weekend. But the man exciting me is Jack Ross (MID, $186K) who should come in for Cotchin. He is a decent scorer, highlighted with an 82 not he weekend from 21 touches. His 2 JLT scores were 60 (59%) and 39 (39%). His JS won’t be very good with Dusty and Cotchin only missing 1 or 2 weeks, but nevertheless should play and scores decently. Josh Caddy (FWD, $576K) made his return via the VFL with 17 touches and 53 points. He could slot straight into the midfield with the 2 big MIDS out. Ben Ried (FWD, $443K) uncharacteristically had a whopping score of 118 featuring 20 touches, 12 marks and 3.4. If Darcy Moore doesn’t get up from injury, Ried could play, whether its down back or a shuffle which allows him to play forward. Ben Crocker ($350K) was outstanding with 33 touches and a goal for 117 points. I don’t think he plays though. Callum Brown (FWD, $401K) was good after being dropped from the senior side, with 25 touches and a goal for 87 points. Isaac Quaynor (DEF, $246K) also featured with 19 touches and 60 DT points. Nathan Hrovat (FWD, $371K) has to be considered after 26 touches, 7 marks, 7 tackles, a goal and 125 fantasy points. The Roos are 0-3 so expect a couple of changes. Nick Larkey (FWD, $170K) was also very good with 3 goals and 93 points, but seems to be out of favour with Brad Scott and could struggle to get a game despite doing a lot right. Jed Anderson (MID, $552K) is almost a certainty to play after returning from injury with 8 tackles and 61 fantasy points. Mason Wood (FWD, $444K) was dropped but I can almost guarantee he will come in for Tom Campbell this week. He only played a half but had 3 shots on goal and 33 fantasy points. Paul Ahern (MID, $497K) was a travelling emergency and is a chance to come in for an underperforming Tyson or Scott. 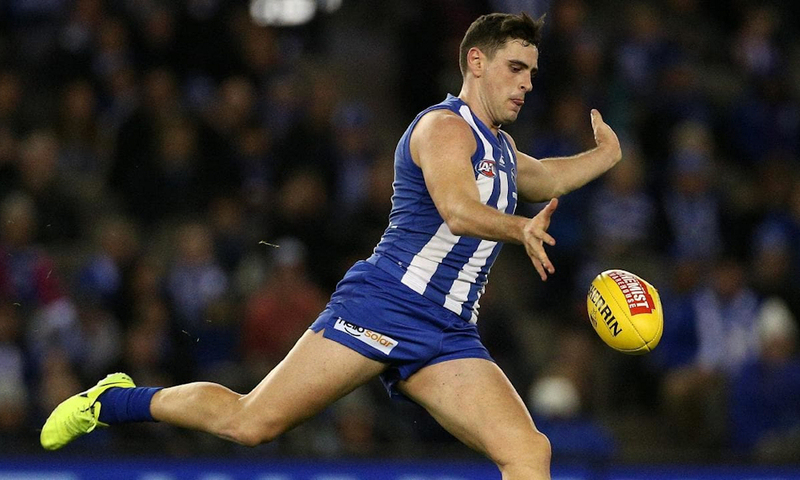 Harry Jones (DEF, $170K) is an on-ball option who could come in if O’Meara doesn’t get up. Unlikely though. He scored 97 (top scorer) from 17 touches, 6 marks and 8 tackles. He has a fantasy Mitch Lewis (FWD, $170K) was stiff not to get a game with Roughead out and with Roughy set to return this week, I doubt he plays. You’re always in the frame when you bag 4 and get 71 fantasy points though. Daniel Howe (MID, $560K) has some VFL games under his belt and is set to return after 16 touches and 68 points. This is only bad news for fantasy coaches as he is renowned as a pretty good tagger. Corey Maynard (MID, $425K) could consider himself unlucky not to be playing AFL after a very strong JLT with plenty of CBA’s. He had 27 touches and 82 points, the top scorer for the Dees, but hasn’t been picked this week. Melbourne teams have already been selected so there’s not much to talk about this here. Sam Draper (RUC, $170K) has been labelled a chance after 22 touches, 39 hitouts and 2 goals for 133 DT points on the weekend. He could be a solid bench cash generator but Zac Clarke realistically would have to make way for him. Dylan Clarke (MID, $250K) racked up as usual with 30 touches and 104 points. I find it hard to see him getting a game with the Bombers midfield. On a side note, its just awesome to see Nathan Freeman racking up in the VFL with 31 touches, 8 marks and 105 points. Pure talent, both AFL and Fantasy just going to waste. Cam Ellis-Yolmen (MID, $592K) was the top scorer for the crows with 36 touches and 113 points. Seedsman’s injury could open up a spot although they play different roles, a with up of roles for other players could see him get a gig. Patrick Wilson (MID, $278K) was also good again, with 25 touches and a goal for 88 points. Hugh Greenwood (MID, $597K) was also in and amongst it and will compete for Seedsman’s spot, after scoring 73 points from 19 touches. Ned McHenry (FWD/MID, $240K) was decent as well with 15 touches and 5 tackles. Chayce Jones was again quiet and could be in some strife if he doesn’t find some form soon. Tyson Stengle (FWD, $211K) was decent but didn’t kick straight, kicking 1.3 for 61 points. Surely, he’s getting closer to a club debut. Jack Trengove (DEF, $419K) was HUGE again, with 189 points featuring 42 touches, 13 marks and 10 tackles, backing up from a 178 last week. He now averages 184 and 43 touches this season. Cries out for a recall but it’s tough to determine who for. Matthew Broadbent (DEF, $351K) continued his strong return form injury with 112 points from 28 touches and 12 marks. Sam Mayes (DEF, $510K) also had another outstanding game with 31 touches, 8 marks and 113 points. Kai Pudney (MID, $170K) was decent with 30 touches and 7 marks for 100 points, and now averages 27 touches and 93 points. Mitch Crowden (FWD, $298K) was on the extended bench for Freo, and may get a crack next week after 32 touches and 120 dream team points. Sam Sturt (FWD, $238K) was quite good with 20 touches, a goal and 82 points. Stefan Giro (FWD, $416K) was also solid with 24 touches, a goal and 70 points. Josh Smith (FWD, $442K) was unlucky to get dropped but was solid in the Eagles first game as an individual WAFL club. He had 20 touches (including 17 kicks) and 7 marks for 78 points. Jarrod Brander (FWD, $185K) will have to do a little more do he wants a recall, after kicking no goals for 58 points. Francis Watson (DEF, $170K) is also pushing hard for selection but 14 touches for 54 points may not be enough this week. You flog. Heard of manners or respect? Good read Ben, cheers mate. You flog. Heard of quality checking? Some good stats Ben, but the typos do make some sections nonsensical. Cheers mate.